Relive the 400-year history of Sendai, the city of trees, through a selection of historic buildings. How did the city grow? Who was this city home to? Together, let us dive into Sendai on the electronic “*Date Bikes“ from the Aoba Castle, where the founder and guardian of the city, Date Masamune, will send us on our way. After spending a visit to “Zuihoden”, the colorful resting place of Masamune and other members of the Date family (entrance is 500 yen), the course will lead us to the home of a very unlikely, but influential son of the city – Bansui Doi, a writer and translator who worked his entire life to build bridges between Japan and other countries. What follows is a trip to the roof of “Fujisaki”, the history soaked hallmark department store of Sendai. 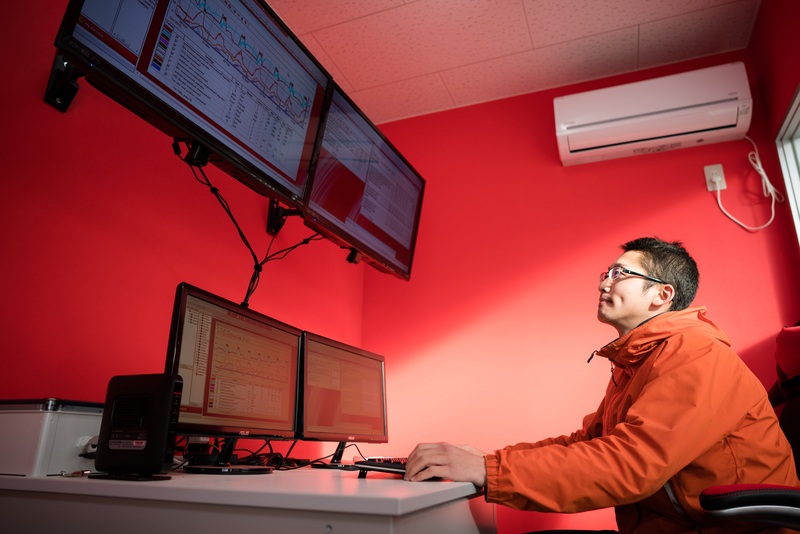 Finally, we will slip into the future at the Sendai mediatheque. Take part in this tour to experience Sendai in four dimensions! *DATE BIKE is Sendai City’s Community CycleSharing Service. Please fill in the [Reservation Form] and send it to us by email. with [Sendai Time Travel] as the title. 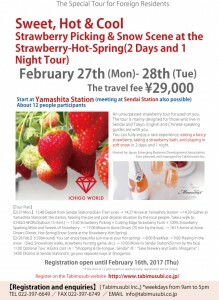 [Sweet， Hot & Cool Strawberry Picking & Snow Scene at the Strawberry-Hot-Spring] is an unsurpassed strawberry tour focused on you. The tour is mainly designed for those who live in Sendai and Tokyo. English and Chinese speaking guides are with you. 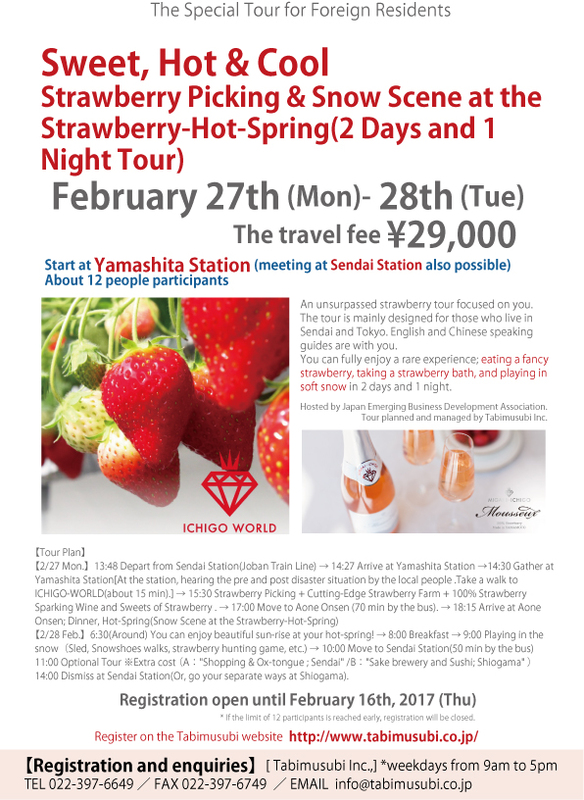 You can fully enjoy a rare experience; eating a fancy strawberry, taking a strawberry bath, and playing in soft snow in 2 days and 1 night. Please fill in [Reservation form] and send us by email. and put a e-mail title [Sweet， Hot & Cool]. Meeting place is at Yamashita station, which has just taken up the threads in last December for the first time in 5 years and 9 months after the tsunami. In front of the station, a reminiscent mural painting draws your attention. 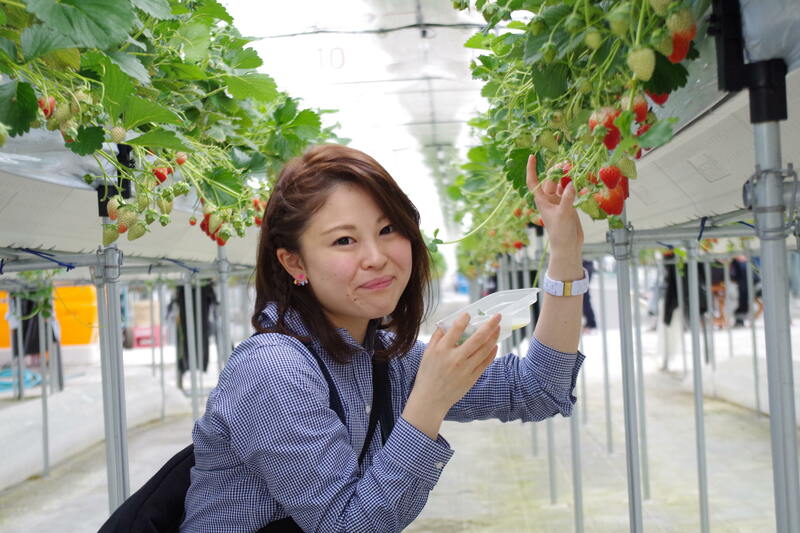 Visiting cutting-edge ICT strawberry farm of ICHIGO WORLD which has been making so-called “edible diamond”, Migaki Ichigo. Also, the 100% strawberry sparkling wine is ready for you. 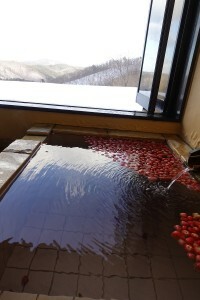 At night, you will stay in the luxury private room with private open-air hot spring of Aone Onsen which is located at the foot of the snow mountain, Zao. Enjoy local dainty foods and the Snow Scene at the Strawberry-Hot-Spring of the hotel only. After playing in the snow around the hotel, you can eat your fill of Specialties and town walks. You have a choice of the optional tour(Extra cost) between “Shopping & Ox-tongue; Sendai” or “Sake brewery and Sushi; Shiogama”. At the station, hearing the pre and post disaster situation by the local people (about 20 min). 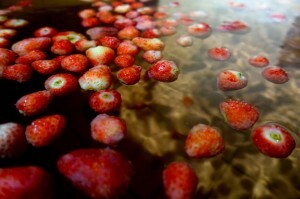 Take a walk to ICHIGO-WORLD(about 15 min). 15:30 Strawberry Picking + Cutting-Edge Strawberry Farm + 100% Strawberry Sparking Wine and Sweets of Strawberry (about 75 min). 17:00 Move to Aone Onsen (70 min by the bus). 6:30(Around) You can enjoy beautiful sun-rise at your hot-spring! 14:00 Dismiss at Sendai Station(Or, go your separate ways at Shiogama). 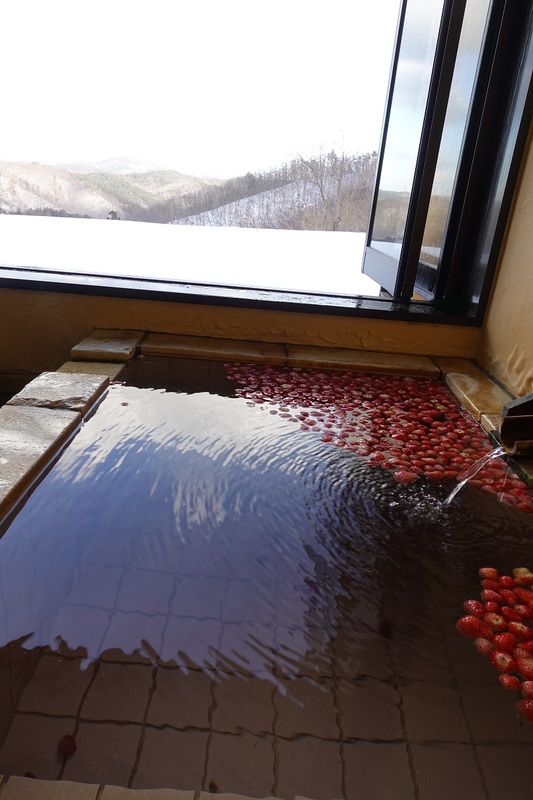 [Monitor tour in Natori] is a FREE Monitor Tour for Foreign Residents. and put a e-mail title [Monitor tour in Natori].